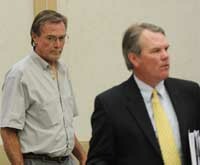 Former Bellevue Mayor Jon B. Anderson pleaded guilty Monday to a charge of felony DUI. A conviction for the offense can carry a prison sentence of up to 10 years. The guilty plea averted a jury trial that had been scheduled for July 26. Anderson, 54, admitted to Fifth District Court Judge Robert J. Elgee that he was driving under the influence of alcohol in Bellevue on Sept. 4, 2010. Anderson has remained free on his own recognizance since his arrest in September. Idaho law states that a person convicted of two prior misdemeanor DUI offenses within the past 10 years shall be charged with a felony for a third violation. At the time that Anderson was arrested for drunk driving in Bellevue, he had a prior Blaine County misdemeanor DUI conviction in 2005 and a misdemeanor DUI charge pending against him in Lincoln County. Anderson served as Bellevue's mayor for five years before resigning in June 2010 following his arrest in the Lincoln County case. He cited health and family issues as the reasons for his resignation. Anderson's attorney, Doug Nelson, told the court on Monday that Anderson's blood alcohol content at the time was .25 percent, more than three times the legal limit of .08 percent. In the Bellevue case, Anderson was originally charged with a misdemeanor. Prior to resolution of the Lincoln County case, the charge from Bellevue was dismissed. Once Anderson had pleaded guilty in Lincoln County, the Bellevue incident was refiled as a felony. Sentencing for Anderson is scheduled for Aug. 29.